In the Fed's latest Flow of Funds report released at noon today, the Fed unveiled released the latest snapshot of the US "household" sector as of March 31 2018. 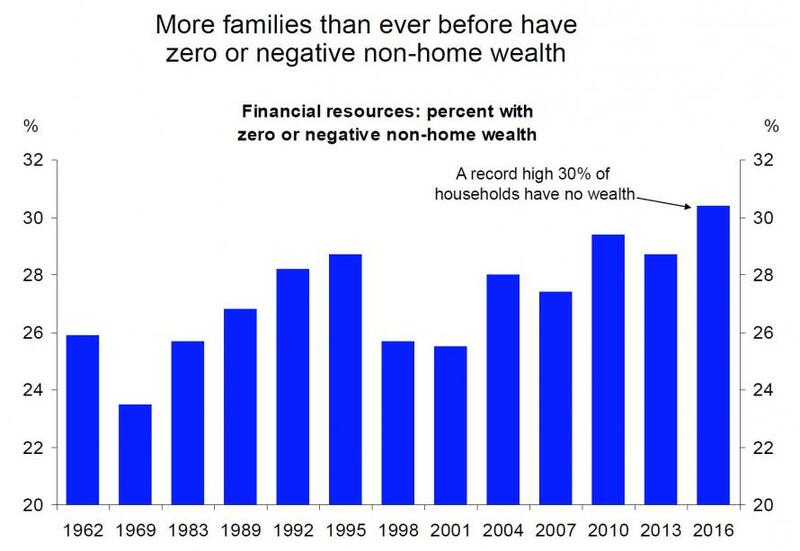 What it revealed is that with $116.3 trillion in assets and a modest $15.6 trillion in liabilities, the net worth of US households rose above $100 trillion for the first time ever, hitting a new all time high of $100.8 trillion, increasing for 10 consecutive quarters and up $1.0 trillion as a result of an estimated $490 billion increase in real estate values, as well as a $511 billion increase in various stock-market linked financial assets like corporate equities, mutual and pension funds, and deposits as the market soared to new all time highs in the fist quarter, even if it ended Q1 on a slightly subdued note after the February VIXplosion and March rate spike. 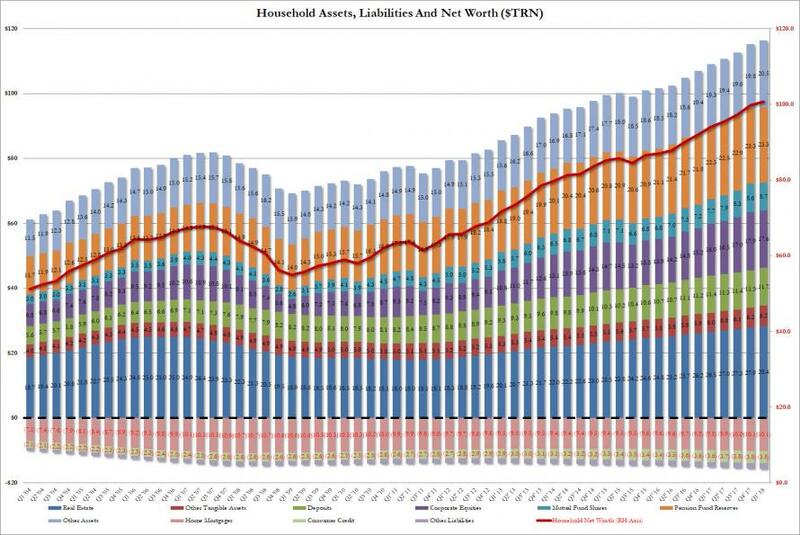 Total household assets in Q1 rose $1.1 trillion to $116.3 trillion, while at the same time, total liabilities, i.e., household borrowings, rose by only $44 billion from $15.5 trillion to $15.6 trillion, the bulk of which was $10.1 trillion in home mortgages. 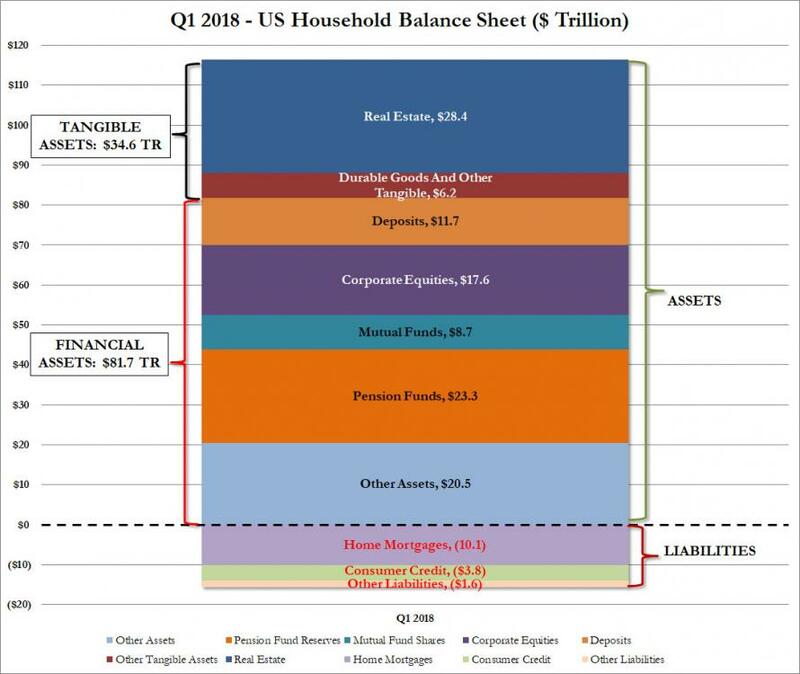 The breakdown of the total household balance sheet as of Q1 is shown below. And while it would be great news if wealth across all of America had indeed risen as much as the chart above shows, the reality is that there is a big catch: as shown previously, virtually all of the net worth, and associated increase thereof, has only benefited a handful of the wealthiest Americans. 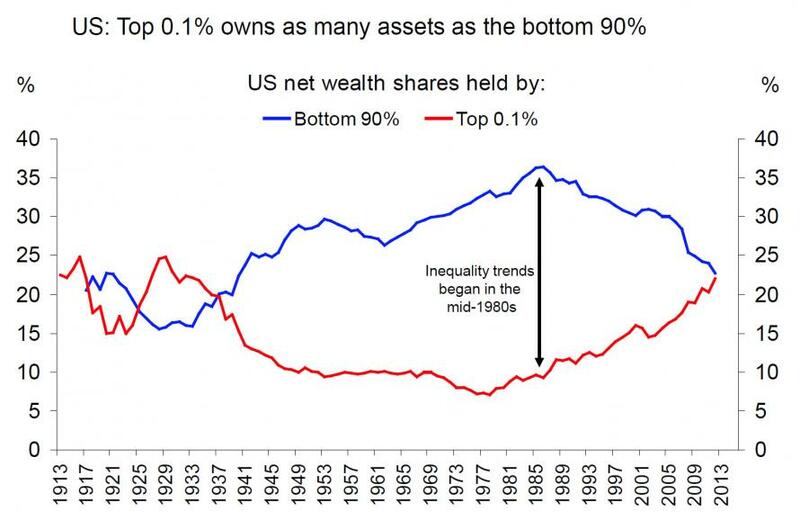 As the following chart from Deutsche Bank shows, the wealth inequality in the US is now as bad as it just during the Great Depression, with the top 0.1% of the US population owning as many assets as the bottom 90%. In the CBO's latest, if somewhat dated, Trends in Family Wealth analysis published in 2016, the budget office showed a breakdown of the net worth chart by wealth group, which sadly shows how the "average" American wealth is anything but, and in reality most of that $100 trillion belongs to just 10% of the US population. In 2013, families in the top 10 percent of the wealth distribution held 76 percent of all family wealth, families in the 51st to the 90th percentiles held 23 percent, and those in the bottom half of the distribution held 1 percent. Average wealth was about $4 million for families in the top 10 percent of the wealth distribution, $316,000 for families in the 51st to 90th percentiles, and $36,000 for families in the 26th to 50th percentiles. On average, families at or below the 25th percentile were $13,000 in debt. In other words, roughly 75% of the $1.1 trillion increase in assets went to benefit just 10% of the population, who also account for roughly 76% of America's financial net worth. It also means that just 10% of the US population is worth roughly $90 trillion, while half of the US population was virtually no wealth, and if anything it is deeply in debt. Even worse, when looking at how wealth distribution changed from 1989 to 2013, a clear picture emerges. Over the period from 1989 through 2013, family wealth grew at significantly different rates for different segments of the U.S. population. In 2013, for example:The wealth of families at the 90th percentile of the distribution was 54% greater than the wealth at the 90th percentile in 1989, after adjusting for changes in prices. As the chart below shows, nobody has experienced the same cumulative growth in after-tax income as the "Top 1%"
The above is particularly topical at a time when either party is trying to take credit for the US recovery. Here, while previously Democrats, and now Republicans tout the US "income recovery" they may have forgotten about half of America, but one entity remembers well: loan collectors. As the chart below shows, America's poor families have never been more in debt. The share of families in debt (those whose total debt exceeded their total assets) remained almost unchanged between 1989 and 2007 and then increased by 50 percent between 2007 and 2013. In 2013, those families were more in debt than their counterparts had been either in 1989 or in 2007. For instance, 8 percent of families were in debt in 2007 and, on average, their debt exceeded their assets by $20,000. By 2013, in the aftermath of the recession of 2007 to 2009, 12 percent of families were in debt and, on average, their debt exceeded their assets by $32,000. The increase in average indebtedness between 2007 and 2013 for families in debt was mainly the result of falling home equity and rising student loan balances. In 2007, 3 percent of families in debt had negative home equity: They owed, on average, $16,000 more than their homes were worth. In 2013, that share was 19 percent of families in debt, and they owed, on average, $45,000 more than their homes were worth. The share of families in debt that had outstanding student debt rose from 56 percent in 2007 to 64 percent in 2013, and the average amount of their loan balances increased from $29,000 to $41,000. And there - as we say quarter after quarter- is your "recovery": the wealthy have never been wealthier, while half of America, some 50% of households, own just 1% of the country's wealth, down from 3% in 1989. And finally, America's poor have never been more in debt.